Rolex dials are as varied as the watches themselves. Over the years Rolex dials have evolved with the technology, styles of the period, and with the evolution of the case model. One of the nice aspects of older Rolex models is that the watch face matches the case and the period the watch was made. Just as how antique furniture appeals to many who have modern furnishings in their household, an antique piece takes you back in history for a brief period. A Rolex watch dial on a vintage piece can do the same thing. Early Rolex sport models came with matte dials. Black matte dials are easy to read, there is no reflection off the dial, and are certainly vintage. A black matte dial matched with the warmth of a plexi crystal screams vintage watch. Vintage black matte dials have painted tritium dial markers which are easy to spot and noted by the “Swiss – T < 25” on the bottom or the dial. Tritium was the go-to luminescence material back in the day, but because of its relatively short effectiveness of staying luminescent, Tritium was replaced with Super Luminova in later years. One of the drawbacks of Tritium was that it wanders on the dial. As the Tritium dries and becomes flakey, the edges lose their crispness. Rolex addressed this problem in the mid to late 1980’s by adding white gold surrounds to the dial starting on the Submariner 16800. Tritium was painted onto white gold hour markers rather than onto the watch face keeping the hour markers crisp and easy to read. Rolex slowly moved to gloss dials at about the same time sapphire crystals became more prevalent in the mid 1980’s and going into the 1990’s. Sapphire crystals started on the GMT models starting with the GMT “Fat Lady” model 16760 in the mid-1980’s, and on the SeaDweller. Matching a shinier crystal combined with shinier face was where Rolex leaned at the time. As Rolex sport watches continue to evolve, there is now a movement back to matte watch faces. 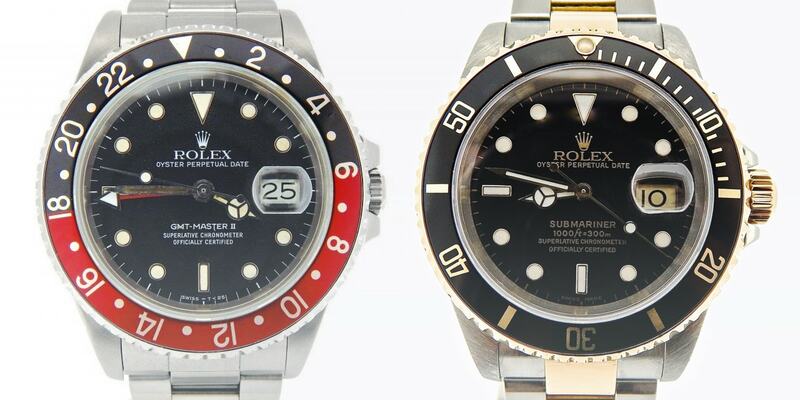 Although the modern day GMT and Submariner sport sapphire crystals, ceramic bezels, and gloss watch faces, there are other modern day Rolexes such as the DeepSea Sea Dweller and the Explorer II equipped with black matte faces. Despite the trend to shiny and glossy, Rolex appears to be going back to its tool watch roots.